Enter via the comments section here. Tell me what upcoming YA releases you're most excited about or your favorite YA of all time, and you're entered. One entry is all you need. I will randomly draw one winner Wednesday 5/26 at noon EST. Winner, you must respond before 5 p.m. on Thursday 5/27 because I will need to know the name you want signed in the book before I leave for the signing. This contest is open to everyone no matter where you are. Now, a little about the book. I have read this book. I love this book. I have even read the second one, and I can tell you -- OMG -- you guys are in for an awesome series with Dana and the world of Avalon. And those dots on the book: Sparkly! How can you resist? YA I'm most excited about? The third Hunger Games (Suzanne Collins) ties equally with the third Strange Angels (Lili St.Crow). All time favourite YA? The Tamora Pierce Alanna books, without a doubt. I reread them every year and love them as much as when I first picked them off the library shelf nearly two decades ago. Since I've seen it classified as YA (okay, maybe only once) before, I hope Poison Study by Maria V. Snyder counts. That was quite possibly my favorite set of books ever! I'm looking forward to Andrea Cremer's Nightshade. It sound wonderful. Upcoming YA most excited about? Tie between Linger and Mockingjay! Here via readingthisbook's RT! Thanks for hosting this contest; the book looks awesome! branquign0le(at)yahoo(dot)de - the o in branquignole is a zero. Oh, everything I hear about Glimmerglass gets better and better! Thank you for giving us this opportunity. :) The YA I'm most looking forward to right now... wow, that's a tough one. I'll go with The Demon's Covenant by Sarah Rees Brennan - I really liked the first in the series, and I heard this one is even better! I can't wait until I get the chance to buy it. Hope you have lots of fun at the signing Kelly! Wow. There are so many YA books that I am looking forward to. Of course, I want to read Glimmerglass. So many books I'm excited about...ahh...Oh! The Iron Daughter by Julie Kagawa is definitely high on the list however! My favorite YA series is the Harry Potter series. Oh dear, don't think I can name a favourite, but the one I'm most looking forward to at the moment has to be Andrea Cramer's Nightshade. It sounds awesome! I love YA series. My 2 favorites are Vampire Academy by Richelle Mead and the House of Night series by P.C. Cast and Kristin Cast. I loved Shiver by Maggie Stiefvater and so I am totally looking forward to Linger. Other YAs on my priority list is Mockingjay,Nightshade,Paranormalcy,Lifted and Restoring Harmony! I adore YA books. My most recent favorite is Hex Hall by Rachel Hawkins. But of course I also love Harry Potter, Twilight and so many others. The Magic or Madness Trilogy by Justine Larbalestier is wonderful also. 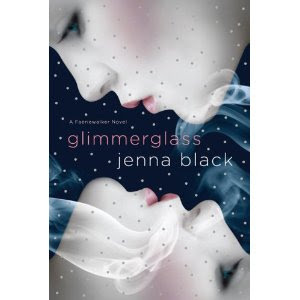 I am most looking forward ironically to Glimmerglass by Jenna Black. I ADORE her adult books in the Morgan Kingsley exorcist series. She's an amazing writer and I am beyond excited to try her first YA book!! It sounds soooo good!!! Thank you for a great contest. My favorite YA series is probably Vampire Academy by Richelle Mead. Im looking forward to the Iron Daughter by Julie Kagawa, and My Soul To Keep by Rachel Vincent. Im excited to read Glimmerglass! Sounds like its going to be a great series. My favorite is the Mortal Instruments series and I cant wait for Clockwork Angel. Oh my goodness, there are so many books that I'm looking forward to like Nightshade by Andrea Cremer, Paranormalcy by Kiersten White, Matched by Ally Condie, Absolution by Jennifer Laurens to name but a few! I am looking forward to the Vampire Academy book series by Mead. My favorite thus far is the Twilight series. But they are also the only YA book I have read recently. All time favorite, since it must be because it's on the keeper shelf in HC, audio, and now TPB format...the Harry Potter series. I can't think of any one particular YA I am looking forward to most, probably all of them as they each have something new to bring to Mt Git'r'Read and my reading fun. Upcoming YA Releases I want? Well, DARKNESS BECOMES HER, by one Kelly Keaton for a start ;-) Also, ACROSS THE UNIVERSE by Beth Revis. Well, Glimmerglass for one, but I also really want to read Crescendo. And I'm so curious about Glimmerglass since couple months ago. The cover is so awesome ! I'm pretty excited about the new Rachel Vincent YA, and also Spirit Bound by Richelle Mead. And of course, yours that will come out next year I'm sure will certainly be awesome!! I can't pck a favorite YA book but I'm looking foward to reading Linger. My favorite YA series is Rick Riordan's Percy Jackson series. My son and I read all five of them between his third and fifth grade years (he's a big reader, and now in sixth grade) ... and I took him twice to hear and meet Rick at Quail Ridge Books. We have two most anticipated YA releases: the final installation of The 39 Clues series, and The Red Pyramid by Rick Riordan (got it last week!). Right now, I'm most excited about Lili St.Crow's upcoming Jealousy. I can't wait! I loved The Hunger Games and Chasing Fire so I can’t wait for Mockingjay. I’m glad to hear you loved Glimmerglass. It is a book I hope to read. favorite YA series is Vampire Academy by Richelle Mead. Some of my favorite YA novels are Rampant by Diana Peterfreund, Voice of Dragons by Carrie Vaughn, Shiver by Maggie Stiefvater, Shade by Jeri Smith-Ready, Hex Hall by Rachel Hawkins, Immortal by Gillian Shields, and The Body Finder by Kimberly Derting. Some of my favorite YA series are the Vampire Academy by Richelle Mead, the Wicked Lovely series by Melissa Marr, and the Soul Screamers by Rachel Vincent. My favorite YA series is the Morganville vampire series by Rachel Caine. My favourite YA series is Georgina Kincaid, by Richelle Mead I'm not sure if that is YA. If not i love The Night World Series by L J Smith. I read so much it's hard to keep track of the books I can't wait for ! But I do have some on mind. I really can't wait for Collin's The Mockingjay (3rd book in Hunger Games Series). I love all of the characters and the plot is so unique. The previous books made me stay up until the ungodly hours of the night! Such an amazing series! Another book I do have on mind is The Clockwork Angel by Cassandra Clare. Her other series, Mortal Instruments, was amazing so I can't wait for her new book ! Thanks for this amazing contest ! Glimmerglass sounds amazing ! Mm, that sounds like a fabulous book! My favorite YA ...that's difficult. Harry Potter, the Study series (Maria V. Snyder), and anything written by Tamora Pierce are all at the top of that list. One book I absolutely am dying to read is Delirium by Lauren Oliver! Before I Fall was amazing! The YA novels I'm most excited about are Nightshade by Andrea Cremer, Linger, Beautiful Darkness, Torment, Mockingjay, and Crescendo. my favorite ya is HP and I also love Kelly Armstrong's series. looking forward to her next one. My favorite anticipated YA is Gena Showalter's "Unraveled". Black's "Guardians of the Night" was a favorite series(though not a YA series)of mine and I can't wait to get my hands on GlimmerGlass. My favorite YA series- "Gone" by Michael Grant. I'm looking forward to MOCKINGJAY by Suzanne Collins. The Hunger Games is wow. I can't wait for the next Wicked Lovely book by Melissa Marr. I just read the new one and loved it! It's probably my favorite YA so far. This book sounds awesome! My fave YA series right this very moment is Vampire Academy. But I am waiting for Linger by Maggie Stiefvater, Clockwork Angel by Cassandra Clare, and Crescendo by Becca Fitzpatrick. There's plenty more but I can't think of them all right now. My favourite YA series has to be Lili St Crow Strange Angels, I really am enjoying the exploits of Dru and friends. The way she rights is so engrossing I find myself not coming up for air for hours, especially during the first novel. I'm really looking forward to (surprise) : ) Glimmerglass & also Matched by Ally Condie. my most favorite YA are probably the ghost stories of Mary Downing Hahn. They rival any of the best adult ghost stories out there. oh, goodness, favorite YA of all time? So I'll tell you my most-looked-forward-to upcoming releases: Zombies vs. Unicorns (ZOMBIES!!!!! ), Fury of the Phoenix by Cindy Pon, and whatever Justine Larbalestier writes next. With bonus props to Sarah Rees Brennan's newly-released Demon's Covenant, because it was my most-looked-forward-to book of 2010, and completely blew me away. Amazing contest and thanks so much for making it international!! My most favorite YA is Shiver by Maggie STiefvater. I can't stop rereading it. In connection with this, the YA I'm most excited about is none other than LInger, the sequel of Shiver! I can't wait for July! My favorite YA is an 1995 vampire novel named Look For Me By Moonlight by Mary Downing Hahn. It was about the darker side of vampires, and, since it was made long before the Twilight phase dominated our YA section, it hold true to the stereotypes and tragic love stories.